Take your kitchens and bathrooms to the next level with a new set of flooring. For an easy way to upgrade your space, shop with us for bold tile flooring at highly competitive prices. At our local store, we carry a wide range of product options for spaces of any size. Whether you want to enhance your kitchen, entryway, or basement, you will be able to do it without breaking your budget. Take advantage of our tile flooring prices when you shop at our showroom today. Over time, it is only natural for homeowners to get tired of the same old look in their spaces. When your home is in need of a style overhaul, working with us for a tile flooring installation will deliver the results you want. Our showroom carries an endless supply of products to choose from for each room in your residence. Whether you have a small bathroom or an expansive basement, our ceramic tile flooring will create a fresh style in every part of a home. We feature flooring from top brands in the industry, including Dal-Tile and Happy Floors. Don't let cost be a factor that deters you from upgrading your home décor. With the exclusive tile flooring prices from our store, you will make every room stand out without stressing over the cost of the job. We make it easy and affordable to transform your residence to a more modern look. We are proud to offer 12-18 months financing on our products. Call us today to find out more about this special offer. After you spend your time choosing the ideal tile flooring for your space, we are happy to complete the remainder of your services. With a tile flooring installation from our team, you will do away with outdated flooring and enjoy a fresh new style. Our experienced contractors perform your installation to the highest standards. When you work with us, you can trust that your project will be completed the right way the first time. Protect your investment for many years to come with our services. We do not cut corners, and we take great care to ensure a flawless result for every project. At our showroom, we find that many homeowners prefer to have a DIY approach to their residences. While it may be tempting to perform a tile floor installation on your own, this job is best left to the professionals. Failing to complete your installation the right way can lead to uneven tiles, chips, cracks, and other flaws. Ensure a smooth result to your services when you turn to our team for a tile flooring installation. Does your home have children or pets? When you need a durable solution for your flooring needs, choose ceramic tile flooring for every room. Ceramic is a popular material due to its strength and durability against grease and water. 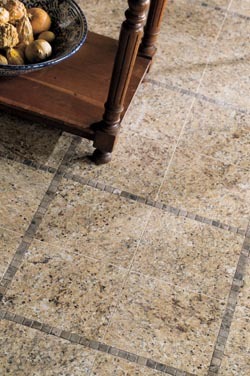 Contact us to shop with us for your new tile flooring. Our affordable tile flooring prices are available for customers throughout Covington, Billings, Lamont, Pond Creek, and Enid, Oklahoma.